One of my very favorite books of 2014 (so far) is Tin Star, a young adult sci-fi novel set on a mostly-abandoned space station that orbits an abandoned planet. I adored the world-building, the heroine's emotion and trust issues, and the way the story played with what it means to be human. I was seriously, seriously impressed, and I can't wait for the sequel. WHICH IS COMING SOON, thank Thor (and yes, that was a nod to my current Avengers fanfiction addiction)! 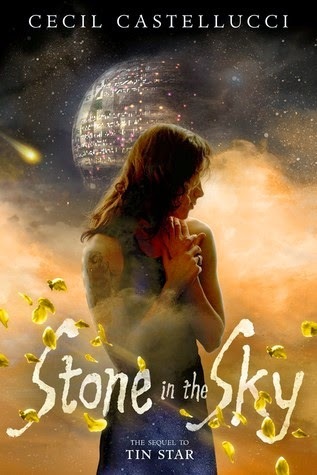 Cecil Castellucci's Stone in the Sky will be released by Roaring Brook Press (Macmillan) on February 24th, 2015. Huh, it's been a really long time since I've read anything that takes place in space, and this book sounds really interesting to me. I may have to go back and check out book 1 and see what it's all about. Cool pick, thanks for sharing! I just purchased Tin Star from the Arlington book sale over the weekend. I'm definitely going to start reading it soon (although, maybe not until closer to the second book's release date since I'm incredibly impatient when it comes to waiting for sequels).